This beautiful, practically new home is less than 2 years young. Since purchase, over $60,000 in upgrades and additions have been added to this quality constructed home including a $40,000 HEATED, Salt generator pool, with brick paver deck, LED color wheel lighting, and SUPER screen enclosure, to keep enclosed pool area cooler in the summer time. Screened entry with custom,wrought iron screen door, custom window treatments throughout, including wood toppers, wood planked floors added in 4th bedroom, using currently as an office/Den, Additional brick paver drive added for boat/R.V. parking, Garage ceiling insulated, and insulated garage doors added, extra shelving added in closets and garage, home fully wired for Cable, Satellite, AND Antenna. 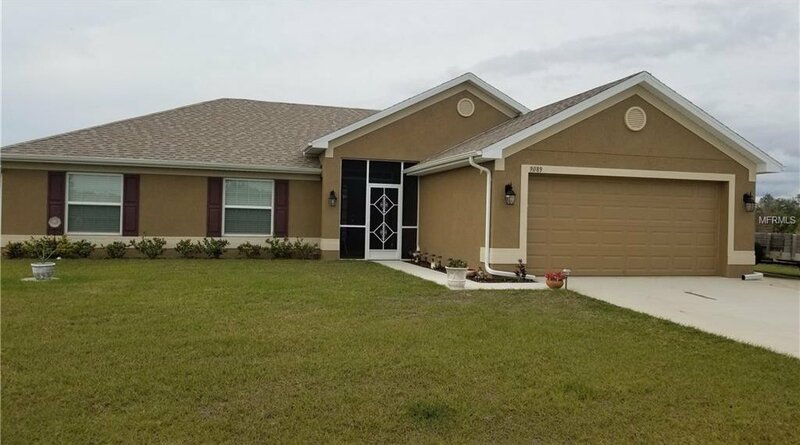 Home features Master suite with both shower and soaking tub in master bath, double vanities, granite tops throughout, upgraded stainless steel appliances throughout, beautiful, covered lanai, with a private back yard over looking a recently dredged, freshwater canal, loaded with fish. To make this deal even sweeter, owner/agent is offering the recently cleared, TWO adjacent canal front lots for an additional $19500! Build a nice R.V. garage, turn it into a tropical park, build another 2 homes, or just maintain for the privacy and space. The additional lots are cleared with a few nice oaks and palms, and very high ground from fill dirt added decades ago from canal construction. Seller/agent cannot close until March 20th, 2019. Listing courtesy of TROPICAL COAST REALTY. Selling Office: TALL PINES REALTY.